The Liberal Democrats would spend £3.5 billion more on mental health care in England over the next parliament, if they were elected. •	Hundreds of thousands more people will get access to talking therapies for anxiety and depression. The announcement comes as the party releases its ‘Manifesto for the Mind’. The money is part of an overall pledge of an extra £8 billion to plug the funding gap in the NHS. 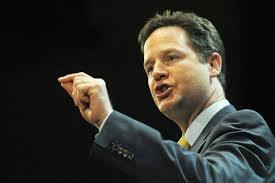 Liberal Democrat Leader Nick Clegg said: “Liberal Democrats believe that no matter who you are, where you come from and what your circumstances, you should not be denied the opportunity to fulfil your potential. “Yet, in Britain today, millions of people are denied the opportunity to get on and live happy, fulfilling lives because they live with mental health issues. “One in 4 of us will experience mental health problems at some point in our lives. And yet, for decades, mental health services have been neglected by successive governments, the poor relation of physical health problems. “That's why, in government, the Liberal Democrats have slowly started to undo that damage. “In the coalition government’s final Budget we secured more than a billion pounds to revolutionise services for children and young people, alongside the first ever waiting times standards and a plan to roll out talking therapies across England. “But we cannot and must not rest there. Equality for people with mental health issues is a liberal mission. “As this document sets out, in Government again, we will continue to put mental health front and centre of the political debate. “That's why I am so immensely proud that we are the first party to put equality for people with mental health problems on the front page of our full General Election manifesto. “Only the Liberal Democrats can keep Britain on track and provide both a stronger economy and a fairer society with strong public services. Liberal Democrat Spokesperson for Health, Norman Lamb, added: “This government has made great strides towards better mental health care. We have invested millions in talking therapies, eating disorders and children's mental health. In response, Felicity Dormon, senior policy fellow at the Health Foundation, said: “The Health Foundation’s recent report ‘Is mental health care improving?’ shows declining quality in mental health services outside of talking therapies for anxiety and depression, and how mental health services have historically had lower funding relative to need. More spending on mental health can redress these issues, provided it is focused on revolutionising the way mental health care is delivered – making services more preventative and better suited to people’s needs.